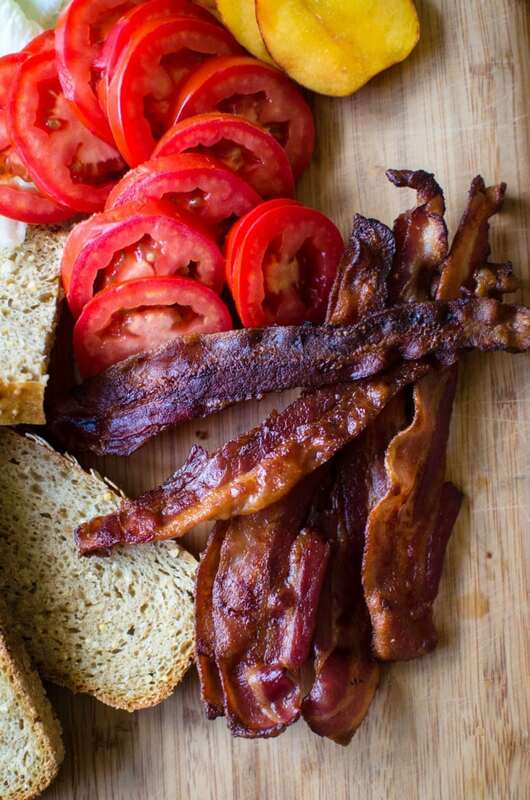 What could be more perfect/delicious/satisfying/awe-inspiring than a crisp and juicy summer BLT? Maybe homemade ice cream. Maybe. But the BLT sure does come in close as my favorite summer food. It’s essentially the darling of summer sandwiches – in American culture anyway. How can you go wrong when you make one with freshly baked bread, juicy garden tomatoes, crisp lettuce, and strips of smokey salty bacon??? It’s hard to mess that combo up. However, over many summers of eating these beloved sandwiches, I’ve learned of a few add-ons that really take this classic over the top for me. 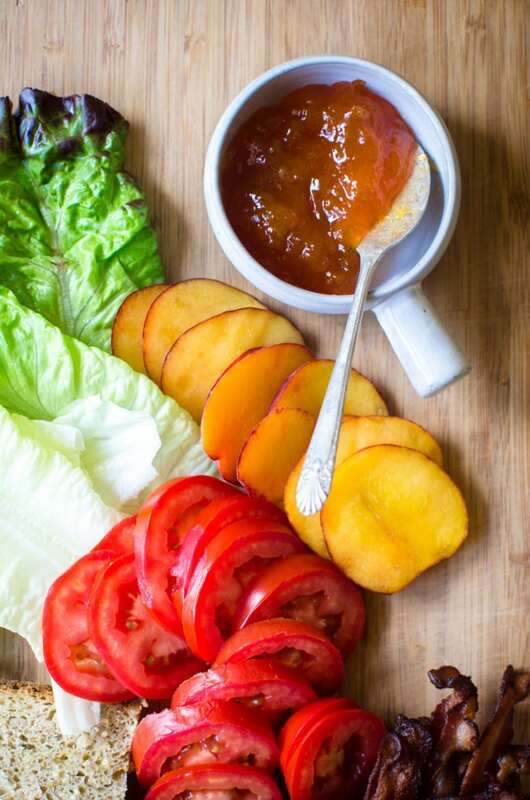 First up: throw in a few sweet and juicy slices of a perfectly ripe peach in with your tomato mix. Yep, you heard me. Peaches. They lend a florally sweet flavor to the sandwich that is just knock-your-socks off amazing with the bacon and tomatoes. Next, spread a slather of your favorite fruit jam on the bread. I’d recommend apricot (like I used here) or blackberry. If you have fresh basil lying around, a few leaves of that are a welcome, food heavenly-like addition that will keep you coming back for another sandwich day after day after day…. 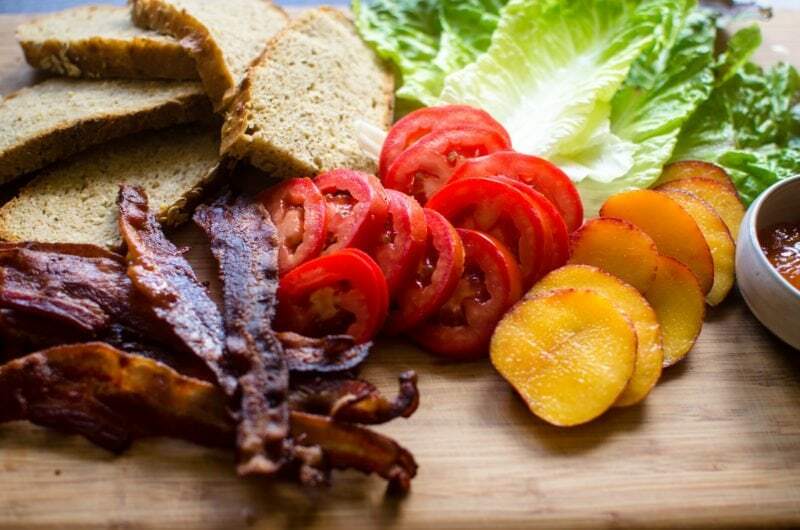 Thick cut bacon + sliced peaches + sliced tomatoes + soft, red leaf lettuce + homemade jam + freshly baked bread = my ultimate summer meal of choice that has me doing the happy dance right about now. If you have homemade ice cream for dessert after eating this – well, my friend – then you really have it made! 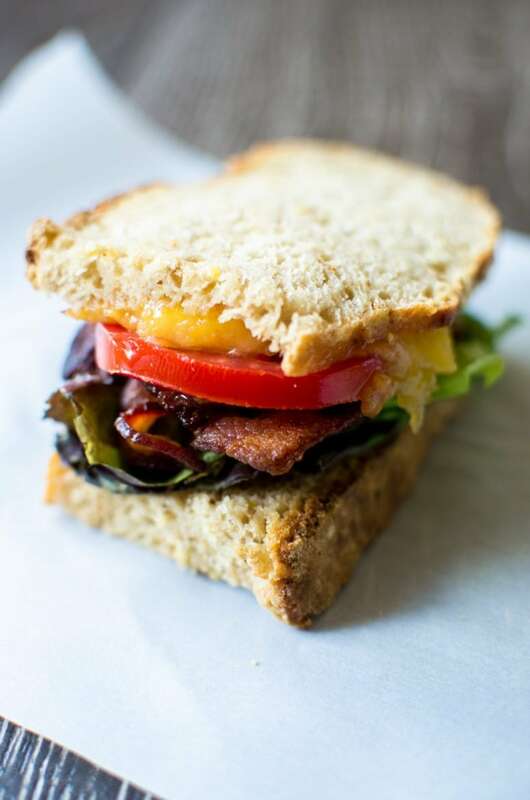 The BLT can certainly be considered the darling of summer sandwiches - try my favorite version with fresh peaches and homemade jam for a tasty twist on the classic! 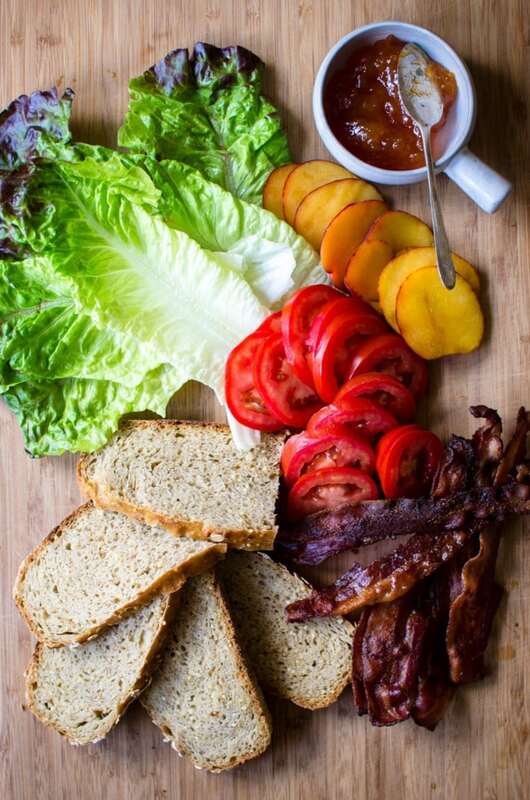 Place the ingredients for your BLT on the bread in the following order: bread, jam, 3 lettuce leaves, 3 bacon slices, 3 tomato slices, 3 peach slices, 3 basil leaves, and end with a second jam-slathered bread slice. Enjoy right away! Be sure to have extra napkins lying around for juice dribbles - you will need them! 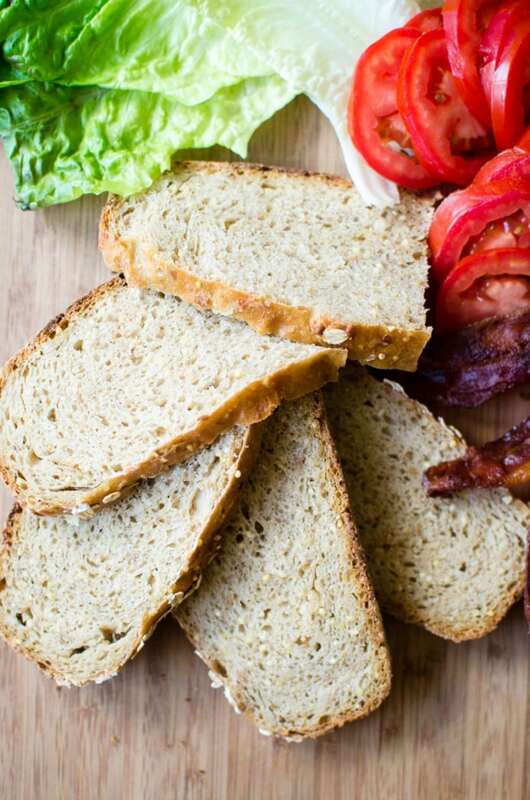 What makes the ultimate BLT sandwich for you? I’d love to hear about it in the comments below! OMG. This looks SO delish! For me, it’s all about that thick cut bacon. But your version with sliced peaches and jam sounds so fresh! I’m a sucker for a good sweet and salty combo. I definitely have to try this. Sharing this post!